As a Respiratory Therapist, it’s very important to know how to perform all the procedures for pulmonary function testing; and in order to do so – you must know the PFT Equipment! Luckily, that is what this study guide is all about! 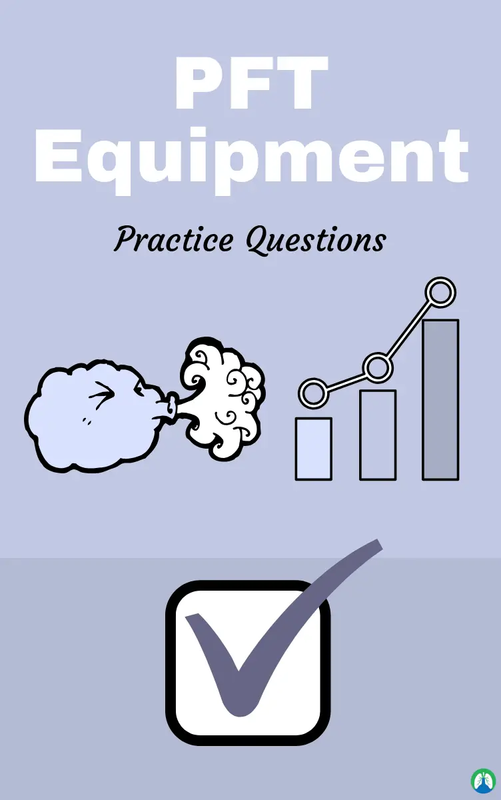 The practice questions below will help you develop a good understanding of all the Pulmonary Function Testing Equipment that you must know as a Respiratory Therapy student. So, if you’re ready, let’s go ahead and dive right in. 1. What are the 3 types of volume displacement spirometers? Water-seal, dry-rolling seal, and bellows type. 2. What are the 5 types of flow-sensing spirometers? Turbine device, heated wire flow sensors, pitot tube flow sensors, pressure differential flow sensors, and ultrasonic flow sensors. 3. What are the advantages of the water seal spirometer? As a patient breathes in and out, the bell floats up or down proportionally. The pin attached to the outer part of the bell, which marks the kymograph producing a recording of the amount and speed of the bell’s deflection. It is very sensitive to very small changes in volume. It maintains calibration over a long period of time. 4. What is the Collins water seal spirometer? It has vertical 7-10 L cylinder. It can calculate VC and FEV1. On inspiration, the bell float moves down while the pen moves up (expiration vice versa). 5. What are the disadvantages of the water seal spirometer? Cumbersome and not very portable, potential contamination due to water spills, and challenging to keep the device clean. 6. What is a dry-rolling seal spirometer? It has horizontal 10-12 L cylinder. As the patient breathes in and out, a piston inside a cylinder is displaced back and forth to record volume displacement. It has very little resistance and considered the most effective volume displacement device. 7. What is a bellows type spirometer? It has vertical or horizontal 7-8 L (smaller). It utilizes a kymograph to record volume displacement. Referred to as wedge or bellows type. It won’t work if dirt or particles got inside. 8. What is a pneumotachometer? It is a device that measures gas flow directly. 9. How do flow-sensing spirometers work? The physical principle used to produce a signal proportional to gas flow. The signal is integrated to measure volume in addition to flow. 10. What is flow integration? It is the process in which flow is divided into many small intervals (time). Volume from each interval is summed. 11. What are the advantages of flow-sensing spirometers? It is smaller and easier to maintain and clean. It also uses disposable sensors. And it is very portable and may be used in any setting. 12. What is a turbine-type flow sensor? It is rotating vane mounted on jeweled bearings drives reduction gears connected to the main dial. It has a limited measure of high flow greater than 300 L/min. its compact size makes it useful at the bedside. 13. What is a heated wire flow sensor? It is based on a cooling effect of gas flow. Consists of a heated wire element. Gas flow past wire causes a temp decrease in proportion to the mass of gas and its flow. The flow signal integrated electronically or by software to obtain volume measurement. It is reusable with a bacterial filter. 14. Does the heated wire flow sensor meet ATS recommendations? Yes, for accuracy and precision. It can do all PFTs and utilized by CareFusion Vmax PFT system. 15. What is a pitot tube flow sensor? It utilizes the pitot tube principle where the pressure of gas flowing against a small tube is related to the gas’s density and velocity. Flow is measured by placing a series of small tubes in the flow sensor and connecting them to a sensitive pressure transducer. 16. Does the pitot tube flow sensor meet ATS recommendation? Yes, for accuracy and precision. It is utilized by Medgraphics company PFT. It is also reusable. 17. What is an ultrasonic flow sensor? It is a tube with membranous ports on either side permits high-frequency sound waves to be passed through a stream of gas. The ports angled so that sound waves speed up or slow down. 18. How can flow be measured accurately in ultrasonic flow sensors? By measuring the transit time of sound pulses compared to conditions of no flow. This method allows an inexpensive disposable tube to be used and prevents contamination of ultrasonic transducer themselves. 19. What are portable office spirometers? Flow sensing type. Many use disposable flow sensors. Sensors are pre-calibrated at the time and include calibration code for software. 20. What is a peak flow meter? It consists of resistor or flow tube and a movable indicator. The movable indicator is deflected in proportion to velocity of air flowing through device. 21. What is peak expiratory flow (PEF)? It is recognized means of monitoring patients with asthma. It can be read directly from the calibrated scale. 22. What is a low range peak flow meter? It measures flows up to 400 L/min. Useful for small children or for patients who have marked obstruction. 23. What is a high range peak flow meter? It measures flows as high as 800 L/min. It is designed for adult patients. 24. What are the two types of measuring devices? 25. What are volume measuring devices? Spirometers, water sealed/dry rolling. It is very accurate but requires leak checks are large and difficult to clean. It uses kymograph to graph results. It also measures time (x) and volume (y). 26. What type of device is also known as a spirometer? 27. What are the types of volume measuring devices? 28. Volume measuring devices are very accurate but require what? 29. Leak checks in volume measuring devices are? They are large and difficult to clean. 30. What does a volume-measuring device use to graph results? 31. Volume devices measure time on which axis? 32. Volume devices measure volume on which axis? 33. What is PFT equipment controlled by? 34. What are the different types of volume-measuring devices (spirometers)? 35. What do spirometers reflect as it expands and collects gases? 36. What does a spirometer’s speed of expansion reflect? 37. Flow-measuring devices are called what? 38. What does a flow-measuring device measure? They measure changes in pressure as it flows through minimal consistent resistance. 39. What are the uses of flow-measuring devices? Screens, capillary tubes, fiber sheets, and filter paper. 40. Why are flow-measuring devices heated to body temperature? To avoid condensation which could change resistance to flow (BTPS). 41. How closely a measured value is related to the true value of the quantity measured is? 42. What are the 5 things that accuracy depends on? Linearity, frequency response, sensitivity to environmental conditions, calibration, and patient compliance. 43. What do you call the expression of an instruments ability to reproduce a measurement (repeatability)? 44. What is a device for measuring volume or flow changes in the airway openings? 45. How do you classify spirometer on what they measure? Lung volume changes or airflow. 46. What are some examples of volume-displacement devices? Water-sealed spirometer, bellows spirometer, and dry-rolling seal spirometer. 47. What are the flow-sensing devices can measure airflow? Thermal or hot wire anemometers, turbine or impeller device, and ultrasonic and differential pressure device. 48. What is an example of a flow-sensing device? 49. What do you call the water-sealed spirometer? 50. Water-sealed spirometers consist of a Bell that is sealed from? 51. What is attached to the pneumotachograph to prevent moisture and condensation build up on the capillary tube? 52. What consists of a coiled tube that has a needle attached to a calibrated system via a gear mechanism? 53. What are the 3 different types of electromechanical transducers? Strain gauge devices, variable inductance devices, and variable capacitance devices. 54. What pressure transducer uses a sensor that consists of a metal wire or semiconductor incorporated into a Wheatstone bridge circuit? 55. What transducer consists of a stainless-steel diaphragm that is positioned between two coils? 56. With a variable inductance transducer, when not flexed, the two coils are equal with each other. The diaphragm flexes when what is applied, which changes the inductance between the two coils? 57. What transducer is like the inductance except the diaphragm of the device constitutes one plate of a capacitor and the other half of the plate is a stationary electrode? 58. Which transducers are commonly used for measuring respiratory and cardiovascular pressure? Strain gauge and variable inductance transducers. They respond quickly to change and can respond to a wide range of pressure and are very insensitive to vibrations and shock. 59. What kind of transducers are large and very sensitive to vibration with a very poor frequency response? 60. What must be documented daily to show that quality control is being performed in the laboratory? Volume verification, spirometry procedure manual maintenance, log that documents daily instrument calibration, problems encountered, corrective action required and system hardware changes should be maintained, biologic standards, known volume syringe, and monitor practitioner performance. 61. In volume verification (calibration) for at least daily before testing, use a calibrated known volume syringe with a volume of at least how many liters? 3 Liters. This is to ascertain that the spirometer reads a known volume accurately. 62. With calibration, the known volume should be injected and/or withdrawn at least three times, at flows that vary between? 63. The known-volume syringe must be checked for accuracy at least quarterly using a second known-volume syringe with the spirometer in what mode? In client-test mode, this validates the calibration and ensures that the client-test mode operated properly. 64. How do you calculate the % accuracy? (measured volume – 3L/3L) x 100. 65. Why are accurate and reliable measurements of spirometry very important? Otherwise, comparison with reference normal values is meaningless. One would have no confidence that a given result or change in results over time is real. 66. What are the 4 things that the practice of spirometry requires an ongoing program of preventative maintenance and quality assurance? Regular cleaning (manufacturer suggestions), calibration checks (spirometer manual), equipment maintenance to ensure that the spirometer is operating correctly, and regular review to ensure ongoing test quality. 67. A very useful and practical method of assessing the overall performance of the spirometer is to regularly test a healthy subject how often? Every week. This is biological control. 68. Generally, a variation of more than 5% in FEV1 or FVC should alert you to a problem and the need to? The need to have your instrument checked and serviced. 69. Ideally, when is regular calibration/validation usually performed with an accurate 3L syringe? 70. Can you use re-useable mouthpieces on patients? Yes, re-useable mouthpieces must be cleaned and disinfected between patients. In the case of disposable mouthpieces, a new one must be used for each patient. 71. What are pneumotachometers used for? 72. How would you describe a pneumotachometer? Small, portable, easy to maintain, and disposable. 73. What flow should you not use with a turbine or respirometers flow sensors? Greater than 300 L/min or 5 L/sec. 74. What can a Wright respirometer measure? Vital capacity, but not forced vital capacity. 75. When does a Wright respirometer measure respiratory rate? When the patient is breathing in machine. And that wraps up our study guide on the Pulmonary Function Testing Equipment that you need to be familiar with as a Respiratory Therapist. I truly hope that these practice questions were helpful for you. If you go through this study guide a few times, I have no doubt that you will learn about each and every piece of PFT Equipments that is required for you to know. This will not only help you now, but also for years to come! Thank you for reading and as always, breathe easy my friend.